Tokyo, October 7, 2015 – Fuji Heavy Industries Ltd. (FHI), the manufacturer of Subaru automobiles, will unveil two new concept cars at the 44th Tokyo Motor Show 2015 (Press Days: October 28 and 29; General Public: October 30 to November 8). The Company also plans to exhibit four new production models scheduled to be announced on October 28, and four other models for a total of ten models being shown. “New Subaru Story” is the theme of this year’s booth. By providing automobiles that can be used with “enjoyment and peace of mind”, Subaru wants to be broaden the activity realm of customers, becoming the occasion for a new story. At this year’s show, the “Subaru Life Theater” will use five large screens to portray the worldview of “enjoyment and peace of mind” provided by Subaru. 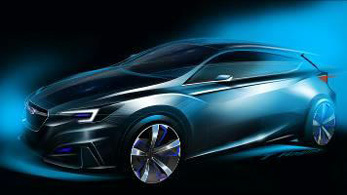 Among the products on display will be two concept models in their world premieres, the “Subaru VIZIV Future Concept”,*1 giving substance to Subaru’s future vision by incorporating automatic driving functions and other advanced safety technology, and the “Impreza 5-Door Concept”, a design study model of the next-generation Impreza. Visitors will also be able to see the “SporVita Series”, special editions of the WRX S4 and Legacy B4 with high-quality interior space; the “S207”, an STI*2 complete car based on the WRX STI; and upgraded editions of the Forester and Subaru XV, for a well-rounded experience of the “enjoyment and peace of mind” Subaru vehicles offer. The official Subaru website (http://www.subaru-global.com/2015tokyo.html) will feature information on the Subaru booth. *1. VIZIV is a name derived from Vision for Innovation. *3. Ustream is a live streaming service operated by Ustream Asia Inc.
Subaru VIZIV Future Concept is a SUV-type concept model embodying the future vision of car development for “enjoyment and peace of mind” that Subaru wants to provide to customers. Along with a package of design features that motivate the owner to get out and get active, this car gives a look at next-generation technologies that will further enhance the reputation of Subaru for “enjoyment and peace of mind” in driving. Among them are the automatic driving technology resulting from the ongoing evolution of EyeSight, and the power unit combining a downsized turbo engine with a hybrid system. Subaru remains focused on providing cars that enrich the lives of customers, as the start of an exciting new chapter. The Subaru VIZIV Future Concept gives a glimpse at the future Subaru has in mind for the brand. The design concept is “Subaru & Active Life”. Giving concrete form to the Subaru Dynamic & Solid design theme, the design clearly shows the value of “enjoyment and peace of mind”, while generating the urge to go out and actively discover the wide world. •The body as a three-dimensional solid form is given a clear polished surface enhancing the impression of high density and sturdiness. This design along with the powerfully extended fenders expressing the reliability of Subaru All-Wheel Drive (AWD) evoke the safety, enjoyment, and peace of mind of Subaru. 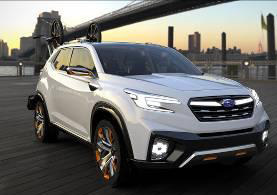 •A true SUV style is expressed throughout, by the strong motifs starting from the hexagonal grill that symbolizes the Subaru identity and flowing to the sides and then ascending to the rear pillar, as well as by the dynamic and wide bumper motif. •The interior design heightens peace of mind and the anticipation of driving, by means of a dynamic motif spreading out symmetrically from the cutting-edge interface between the center and powerful frame. •An active life style is evoked by the beige and black contrast along with the use of orange as a unified accent color inside and out, creating a sporty and joyful space. •A camera for monitoring the driver is located on the instrument panel glare shield, further adding to peace of mind when driving. “Enjoyment and peace of mind” have been expanded by making advancements to EyeSight, Subaru’s original stereo camera-using technology, and by merging the linking technologies like vehicle-to-external communications and telematics. Element technologies have been incorporated that will lead to development of automatic driving worthy of Subaru. 1) Combining the advanced front recognition of EyeSight with all-direction radar sensing, the traffic environment around the vehicle and risk from all sides are monitored. In addition, high-accuracy GPS and map data are used to pinpoint the vehicle location with high precision; and optimum control is applied based on curves, lane lines, and other information about the route ahead. Thanks to these technologies, not only is collision avoidance realized during straight-ahead movement, but avoidance of collision in all directions, with vehicles, bicycles, and pedestrians, when turning at intersections or when backing up, is also enhanced. Automatic driving is realized at all speeds on expressways, and automatic parking is supported at home or in commercial facilities’ parking lots. 2) The adoption of technological advances in telematics and HMI enables anticipation of traffic, weather, and other conditions along the route ahead, as well as effective communication of intentions with people and vehicles. Communication of information supporting the customer’s hobbies and other aspects of an active life is another feature of automatic driving that imparts driving peace of mind while making car life more interesting. The next-generation hybrid system has advanced every aspect of the system first launched on the market with the Subaru XV Hybrid. The combination with a downsized turbo engine improves fuel efficiency, while at the same time the smooth, linear feel when accelerating brings driving enjoyment. The downsized turbo engine adopted by Subaru for the first time in the Levorg has been further advanced, and optimized in all dimensions specifically for the next generation of cars. Compact size, light weight, and net thermal efficiency that is top in the segment raise to a new level the ability of Subaru to combine enjoyable driving with fuel efficiency. The propeller shaft has been eliminated by mounting the single motor concentrically on the rear axle in a compact layout. In addition to AWD capabilities, a flat floor is realized for an expansive, comfortable interior space. Moreover, it inherits the Subaru AWD performance while further improving maneuverability, thanks to the vectoring effect of actively controlling front/rear driving force distribution. The Impreza 5-Door Concept is a 5-door style concept model. It takes its inspiration from the design of the next-generation Impreza envisaged in FHI’s Mid-Term Management Vision “Prominence 2020,” announced in May 2014, as the first Subaru new-generation model. The Dynamic & Solid theme will be featured more prominently in new-generation models as the essence of Subaru. Adopting that theme as core, the design of this concept model expresses value exceeding its class, from the dynamically sporty feel that heightens the anticipation of driving, essential in Subaru design, to the solid performance functions that heighten the sense of innovation and peace of mind. The name SporVita combines the Italian words sportiva (sports) and vita (life). It expresses the way the sporty performance of a Subaru vehicle and the uncompromising pursuit of a quality interior space combine to enrich the car life of drivers. 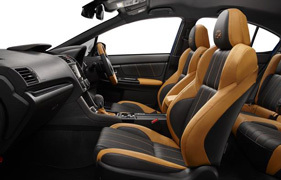 The genuine leather seats unique to the SporVita were designed in collaboration with renowned Italian leather maker Mario Levi, the first such adoption in Japan by a Japanese automaker. Overall style coordination achieved by modifying the trim and instrument panel decorative effects result in a quality interior space having a strong emotional appeal. The sporty performance of the WRX S4 is further enhanced by the 245/40R18 high-performance tires. Moreover, the Advanced Safety Package, providing a higher level of safety in combination with EyeSight, is standard equipment. In these and other ways, the individuality of the WRX S4 has been enhanced, with specifications befitting its status as a sport sedan for adults.